Do you know that you should network to benefit your business - but the very thought fills you with dread? Does attending events where you are expected to participate, drain you of energy? Do you avoid networking for fear of not knowing what to say, what to do or who to talk to? But there is GOOD NEWS - what you may not yet realize is that the very traits you have as an introvert, can be your most valuable assets when it comes to meeting new people and building relationships. I know how you feel - I'm an introvert myself, and I've written 'Pain-free Networking for Introverts' to share my journey from being anxious and lost at business events, to confident and competent in my ability to truly connect and BUILD TRUST. I've worked out strategies – easy things we can do to reduce and eventually REMOVE all the PAIN of networking and MAXIMIZE the REWARDS. I want to share them with you so you don’t have to go through the same struggles that I did. Networking has brought so much to my life - wonderful business connections and referrals of course ... but also friendships, travel, being part of projects that make the world a better place, and even romance. In short, networking is about OPPORTUNITIES - DON"T MISS OUT! As an introvert, you already have networking super-powers you probably never knew about. 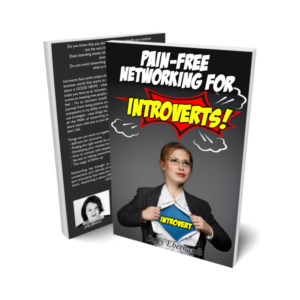 In my free guide, you'll learn how to maximise your introvert advantage to develop a mindset for confidence, go from surviving to THRIVING at network events, and build meaningful business connections with ease! Get Your PDF By Signing Up Below! Want to see me jump out of a perfectly good airplane with Superman and The Flash? I asked my Facebook peeps what crazy thing my publishers (Ocean Reeve aka Superman and Jason Smith aka The Flash) should do to celebrate when 500 copies are sold on pre-order - and they all said SKYDIVING - EEEEEEEEKKK ..... the people have spoken! You can be part of making it happen! Get your Pre Order copy now, before time runs out!